The newly-passed Modern Slavery Act 2018 is a call to action, and The Salvation Army will continue its role in the ongoing process to help end modern-day slavery. Australia now has a Modern Slavery Act. The Salvation Army has partnered with a number of organisations over recent years to advocate for this legislation to be passed, and played a key role in the federal Modern Slavery Act becoming reality on 29 November. More than 40 million people worldwide are believed to be victims of modern slavery, including an estimated 15,000 Australians. “This legislation is a call to action,” said Heather Moore, National Policy and Advocacy Coordinator for The Salvation Army’s Freedom Partnership to End Modern Slavery. The act means that businesses with turnovers of more than $100 million will have to report what they are doing to stamp out slavery in their supply chains. The House of Representatives approved amendments to the draft laws that were raised in the Senate, giving the minister the ability to send non-compliant companies a “please explain” if they fail to report. If, after further engagement, organisations still don’t comply, their names may be made public. “There is going to be a real reputational risk for not responding to that call to action,” Heather explained. 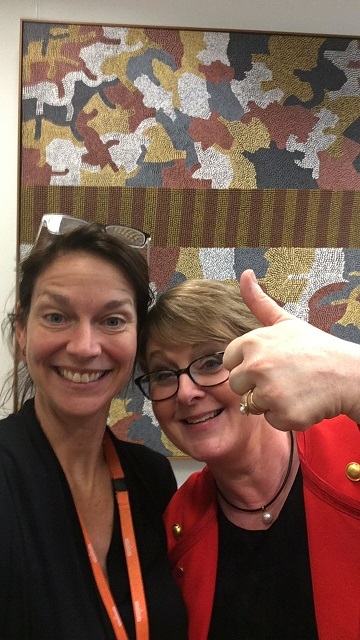 Heather Moore (left) celebrates the Act's passing with Senator Linda Reynolds. The legislation also includes a three-year review to consider how to address issues arising from the legislation and challenges that reporting organisations could be facing. There will be two reporting cycles around these issues, prior to the review. Heather acknowledged that advocating for anti-slavery measures, in which The Salvation Army has been active in Australia for more than 10 years, is not over and no single piece of legislation is ever perfect. “This is the first tranche of legislation; the goal is transparency and building awareness and improving business practices with that legislation,” she said. “Rome wasn’t built in a day and this will take time. This one strategy needs to be married with a range of others to address, and make inroads into, the issue. The Salvation Army would like to acknowledge the work of former employees of the Freedom Partnership, particularly Jenny Stanger, whose work and drive was critical to this success. For more information on the Modern Slavery Act, see Heather’s article here.